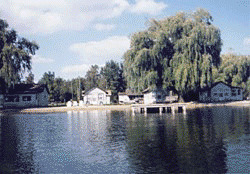 A family-oriented resort located on all sports Lake George. Excellent swimming, fishing and boating with 500 feet of waterfront, a wonderful sandy beach and 3 large private docks. There is a public boat launch on the far side of the lake and one of our docks provides free boat dockage for our registered guests. NEW UPPER LEVEL 2400 SQ. FT. GUEST HOUSE: Sleeps 11 with 3 bedrooms, 1.5 baths, A/C and cable TV. Ideal for two families or small group retreats because it has a gigantic kitchen and dining room plus a huge living room. Entry is through a stairway and the view is spectacular from the deck. A community dining hall, gas BBQ grill and recreation room with a ping pong table are available for all to use. Other amenities: Basketball, volleyball, horseshoes and 2 swing sets, 2 paddle boats, a row boat and a dingy. FIREPITS ARE IN FRONT OF EACH CABIN AND WE SELL FIREWOOD BY THE WHEELBARROW FULL.